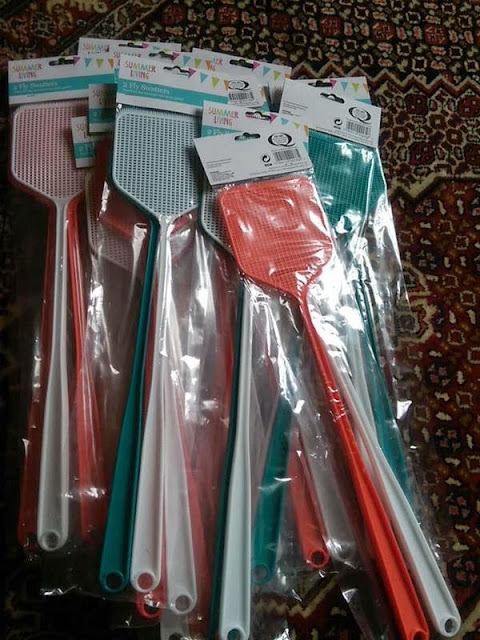 I purchased a large amount of fly swatters from Poundland in March (2 in a pack for ... £1!) to be used in our version of 'Splat'. Basically, you have pictures up on the board/wall, teacher says the vocab and 2 pupils battle it out against each other to 'splat' the correct matching pic with their fly swatters. 1 point per correct answer - I give points out to the first pupil to splat the pic. The first pupil to reach 5 points wins...simple! This can then be played in groups (hence the class set of fly swatters), using a printout of your slide or a copy of whatever you used for the whole class game. I took it one step further today...bit of a risk with a lively, large class of year 8 pupils. I split the class into 2 teams and made them line up, either side of the board. The first person was armed with a fly swatter. From the back of the room, I shouted out the vocab and the two armed pupils had to splat the correct pic, as the original game, but then, they had to pass their fly swatters to the next person and go to the back of their team's line. The next two pupils were then up and had to do the same. And so it continued until a score of 20 was reached. There was much excitement and a huge cheer at the end for the winning team. This was topped off by one of the winning team saying, "Wir möchten 20 Punkte, weil wir gewonnen haben!" How could I refuse with lovely TL like that! Such a good game, and easily adaptable to other subjects. Pass it on! I would love to hear how you get on. Comments below! What timing!! Only last weekend did I leave Poundland armed with these very same swatters! The shop assistant at the till asked in a somewhat perplexed manner if I was stocking up for any particular reason! May I suggest reinforcing the ends of the swatters with gaffer tape, as they do tend to break quite easily if the pupils are being quite enthusiastic. Year 10 loved this to practise modal verb conjugations (of all things! ), so am definitely going to use it as a bit of a carrot in the future.